Chi Keratin Silk Infusion is a reconstructing complex. This handy serum heals and hydrates, dry to damaged hair with its simple application. Apply a small amount in palms of hands and apply through hair then proceed to styling. This can also be used as a heat protector so u don't have to use another product to cater for that need. To break it down for you, the natural keratin rebuilds the hair cuticle whilst the silk penetrates deep into the hair to retain moisture and smooth that rough cuticle. I found this serum just the right consistency, wasn't too runny or thick. A little does cover all of your hair so you don't have to use gallons of this product to see the benefits. This has a lovely clean citrus scent that i could smell through out the day on my hair. My styling was made easier and drying time was dramatically cut down. This instantly made my hair super soft by adding intense hydration and my hair looks and feels healthier each time i use this. I tried the chi product on wet hair and dry and still seemed to get the same results which were great. 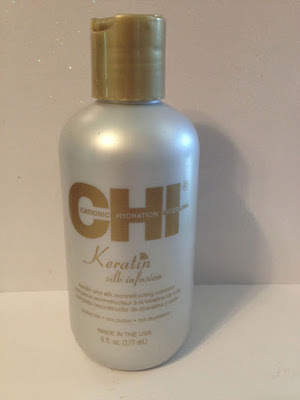 I really like the Chi Keratin Silk Infusion as its a multitasker that has so many benefits. It improves elasticity and prevents future damage. Also a great heat protector and makes hair healthy and smells divine. You can find this with a great price tag, in case your on a budget. Have a look around on the Internet before you buy as you will get it cheaper.